Do you need to wind down from studying for exams all day? We do too! 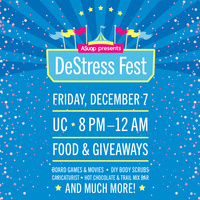 So join us this year for our 2018 DeStress Fest! Our A&E team holds this event on the last day of classes in the fall semester to help students relax before finals week. Enjoy some free snacks, fun activities and amazing prices! The best part? It's all FREE! You don't want to miss out!